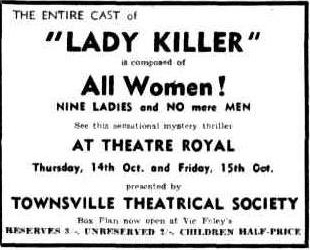 A highly entertaining melodrama, featured by brilliant performances by the all-female cast, was accorded a magnificent reception from a packed house which witnessed the Townsville Theatrical Society's presentation of Cyril Campion's 'Lady Killer’at the Theatre Royal on Thursday evening. A combination of excellent production and stage management, splendid set, stage effects, and lighting, and an appropriate musical score, coupled with the flawless work of the principals of the cast, amply satisfied the audience, which showed its appreciation by sustained outbursts of applause. 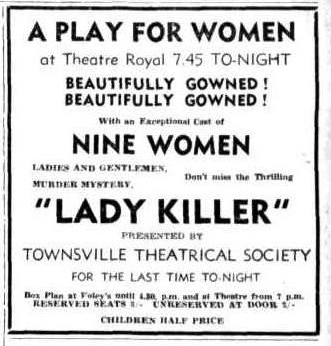 The play itself gave each actress a grand opportunity to reveal the richness of her talents, revolving round the absorbing plot of the ruthless schemes of a blackmailing woman, and the despair and disillusionment of her victims, culminating in the murder of the blackmailer. As the principal sufferer in this scheme of blackmail, Miss Valerie Illich gave a display which, for sheer dramatic art and faithful interpretation of every changing mood, marks her as an outstanding and versatile actress, able to play with conviction any type of role, and worthy of gracing any stage. Her part in this play accentuates her all-round histrionic ability as she portrays with finesse many moods, running the gamut of human emotions; the carefree outlook of a girl in love, about to be wed; the heartbreak and wretchedness when her dreams of happiness are wrecked by the blackmailer; and a hilarious tragic comedy scene in which she temporarily finds solace from her dejection in the comfort of the wine bottle. Miss Illich's impersonations in this latter scene were the highlight of the production. A performance ranking in splendour with Valerie's was that of the villain— and the victim— of the piece, Miss Shirley Davidson, in the role of Avice Mallory. Miss Davidson's portrayal of the avaricious Avice, the blackmailer, was a superb work of art. She displayed to perfection the mannerisms and the ruthless, cold-blooded outlook of this heartless character, completely heedless to the pleadings and the stormings of the victims. The manner in which Shirley was able to sustain her interpretation of the unrelenting, embittered blackmailer, while expertly transmitting the touches of grim humour demanded by her role, was indeed remarkable. As in all stage works, success to a large extent depends on the quality of the supporting cast; and in this case, the remainder of the cast performed admirably, infusing all their enthusiasm into their work, and providing a show which was wonderfully acted to the finish. Playing the other puppets in Avice Mallory’s game of blackmail, Myra Douglas and Carmen Jones performed very creditably. 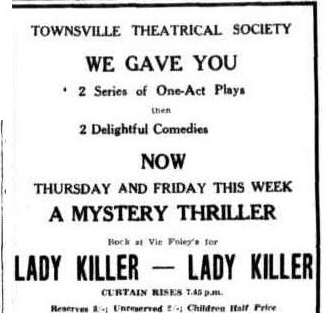 Miss Jones, a youthful newcomer to the Townsville stage, conducted herself with splendid composure, and revealed a definite flair for humour. Mrs. Ella Dawson won the acclamation of the crowd for her polished performance as the slightly neurotic and highly amusing Linda Slingsby, who harbours a suspicion against Miss Jones of having murdered her husband some years previously. As the refined, level-headed Dr. June Greenwood, whose presence of mind and powers of deduction finally point the finger to the murderess, Mrs. Helen Crowhurst could not be faulted. Marie Furse, as Kathryn Weston, the embittered widow endeavouring to retrieve from the blackmailer money swindled from her late husband; and Mollie Walsh and Anne Williams as Mrs. Williams and Milly, the servants, rounded off a fine cast. There was special applause for Miss Bertha Anderson for her superb production. Stage manager was Mr W. Hammond. Music was supplied by Mrs. Summerfield's orchestra, while Rita Jell supervised the make-up, and Len Newman and Alan Stephenson were in charge of electrical effects. The climax of the play, in which the murderess is lured into revealing her identity, completes an excellent piece of entertainment. The performance will be repeated this evening.